Ink: Epson UltraChrome XD pigment ink available in 100 ml, 350 ml and 700 ml sizes that can be mixed and matched with different sizes for each color. In addition to cyan, yellow and magenta color cartridges there are cartridges for matte black and photo black. The switch between matte and photo black occurs automatically based on media type and desired finish. Professional Media: Tested with Epson’s premium semi-matte photo paper ($195 for a 36” x 100’ roll); Epson’s double-weight matte paper ($119 for a 36” x 100’ roll); and Enhanced Matte Poster boards ($95 for 10 24” x 30” sheets). 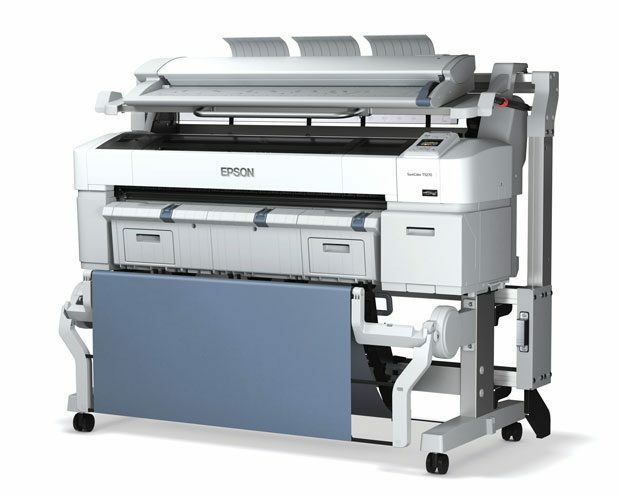 The Epson SureColor T-Series includes printers in three models and widths: T3270 at 24 inches, T5370 at 36 inches and the T7270 at 44 inches. The 36- and 44-inch models can be ordered in single- or double-roll configurations. The printer delivered was the T5270 with a single roll and the Multifunction Module with the scanner/copier/hard drive. The SureColor T5270 is a high-performing, reasonably priced and highly configurable printer at home in both small offices and network environments. The printer takes advantage of advancements in print-head technology combined with ink and media tuned to produce professional products. This printer has speed and functionality to appeal to engineering, CAD and GIS users. The printer is designed for a professional audience, with many add-ons to handle different levels of production, such as a dual-roll configuration and a Multifunction Module that adds scanning, copying and a 320GB print server to save common jobs and prioritize the jobs being printed. When the printer is connected to a network, it can be controlled via a Web browser from any device. The printer came boxed and on a pallet with instructions that were easy to follow for assembly, and the pieces and parts were well engineered for rapid assembly. Mounting the printer on the stand and the scanner atop the add-on stand were the only steps requiring two people. All other elements of assembly were easily accomplished by one person. From unboxing the printer to assembling it on the stand with media and ink–ready to print–took approximately 30 minutes. Adding the scanner bolt-on stand, mounting it, calibrating the scanner and getting it all set to scan or copy took another 30 minutes. Assembly of the print basket took approximately 45 minutes, as there were more parts, and it was certainly more complex than the stands. The basket is a handy feature with settings in two modes to catch a single sheet or up to 20 sheets. The printer has list prices that start at $2,995 for the T3270 up to $6,995 for the T7270D. Add-on modules and additional roll-handling prices are listed in the aforementioned specifications. The multiple sizes and add-on elements provide users a lot of flexibility to find the right fit. The hard drives that come with the Multifunction Module and the Adobe PostScript 3 Module are a must for streamlined printing in busy office settings, as they provide the necessary computing power to speed operations. The True Adobe Postscript 3 Hardware Engine provides direct and hot-folder batch printing and support for secure PDF printing. Testing performance in a busy network setting, however, was not part of this review. After unpacking parts and assembling the printer stand, the next step was loading media and calibrating the ink. Loading a 100-foot roll of photo paper was accomplished by lifting the scanner, which is done easily with a one-hand operation thanks to hydraulic struts, and removing the roll-media adapters that easily change between the different core roll sizes. After locking the adapters into place on both ends, lifting the roll into place and locking the roll, the printer automatically prepared the roll for printing and detected the type of media on the roll. Print drivers were downloaded to a Macbook Air, and the laptop was connected to the printer via a USB cable. The computer includes several networking options but does not connect via Wi-Fi. The print menus offered several options on print quality, and speed and printing was accomplished with ease by either going with automatic settings or adjusting parameters to get the most out of each print. No issues were encountered with the printer driver. The ability to preview the print and adjust orientation and resolution made it easy to fine-tune each job to make best use of the different papers. Automated detection of the paper stock meant that other settings also were automatically adjusted, with the optimal settings aligned with the chosen paper type. The printer was previously reviewed by another publication and shipped with a heavy 100-foot roll of paper loaded, which isn’t recommended practice. Due to the friction and motion during the move, the paper core at the roll’s center deteriorated, with a small pile of cardboard dust ending up around the roll. The printer had some difficulty calibrating at first, indicating that no paper media was present, although the roll was loaded properly. As soon as this dust was discovered and removed, this issue was eliminated. The printer worked quickly and quietly–watching a high-resolution 1-inch swath of ink being applied to the paper was mesmerizing. The speed and resolution being laid down on matte or glossy photo paper often had testers watching in anticipation as the full print emerged. Certainly, that’s no way to aid efficiency in an office, but the speed of printing makes it feasible to send a job from a distant office and have the print ready by the time you walk to where the printer is located, provided no other jobs are in the queue. Printing a D-sized plot in as little as 25 seconds means users could print out multiple copies prior to arrival, depending on how far they have to walk. I received a tip from an Epson tech to increase the sleep mode to maximum minutes and disable the Power-on Cleaning function, which reduces down time and the printer’s need to clean between uses. This saves both ink and time. The printer takes about 1.5 minutes to power up initially or after it goes into sleep mode, so it’s not a great deal of time, but if you use the printer regularly it’s not likely that they need constant cleaning. Instead of relying on the Power On Cleaning mode to return a flawless print every time, I made sure to run a test pattern print before starting any printing session, which reveals if any of the heads are partially clogged. The cleaning settings allow users to select just the heads that need cleaning, reducing the time it takes to clean the heads while saving ink. Most tests returned completely clean heads, but when the printer had been idle for more than a few days, cleaning was a good first step. During a heavy printing day, print patterns were checked multiple times and adjusted between changes to the printing media, which ensured error-free and color-saturated prints. Epson UltraChrome XD pigment ink is available in 100 ml, 350 ml and 700 ml sizes that can be mixed and matched with different sizes for each color. Using the Multifunction Module for scanning and copying large prints was seamless and very beneficial. For testing, old and somewhat brittle building plans were scanned, and the system produced flawless and refreshed copies that informed some upcoming project work. There was an issue with a small tear on one of the sheets that got stuck and kept ripping as it was fed into the scanner, but it was easy to quickly stop and manually eject that sheet and repair it. This issue was fixed on subsequent sheets by carefully checking for small tears on the leading edge and taping and smoothing the leading edge before each scan. After that step, no issues with tearing were encountered. Newer prints were scanned and printed without a single incident. The scanner produces scans and copies from 200-600 dpi, and it scans at a rate of 6 inches per second. The scanner also includes a 320GB print server that helps manage job queues as well as save and reprint jobs. This feature can be added with the Multifunction Module or the optional Adobe PostScript 3 Hardware Module that adds a 1.6 GHz dual-core processor as well as PDF and batch-printing capability. The scanner is mounted above the printer via a stand that easily locks onto the back of the printer stand and includes a safety bar to prohibit tipping backwards, as the printer becomes top heavy with the Multifunction Module mounted. The scanner is hinged on hydraulic struts that allow for easy lifting to access the paper roll and top of the printer. Initial printings were done on semi-matte photo paper, then double-weight matte paper and the enhanced matte poster boards that were provided. A quick review of Epson’s professional imaging media site reveals a large number of additional media types available. The matte papers are typical for the types of projects this printer was designed for, but the many available options indicate that Epson also does a strong business in photography, fine arts and signage. The photo paper was an impressive output that required a bit of careful handling. The prints needed to be laid out and kept flat–a few prints were draped over a smaller table and got a bit crinkled. This issue was easily avoided after adjusting to the fact that the paper could easily form creases. Outputting direct to poster board was a fun but somewhat finicky process. The printer has several poster-board supports that need to be lifted into place. These supports are a bit difficult to lift and lock, and the plastic on these parts seems a bit light, as one support was broken in an effort to understand how it locked. According to Epson, the part is easily fixed. Aligning the poster board perfectly also was a bit of a challenge as the board was slid in and visually aligned to marks on the supports. I didn’t end up with any crooked prints, but it would’ve been nice to have a foolproof guide to aid alignment. The prints on the board came out beautifully and were ready to frame or mount without any further effort. These cardboard prints proved to be the most commented upon output. Having a full complement of media and large cartridges for testing led to some interesting outputs. A large number of maps, satellite images, infrastructure project renderings and other aligned engineering, CAD and GIS outputs were created. After these tests and proven performance, a lot of paper and ink were left over. Without having to worry about the cost, several door-size prints of movie posters and sports greats were made for family that were nicely timed with the printer’s delivery around the holidays. Tall and colorful posters that filled an entire room door were a massive hit with the younger set, and I thank Epson for allowing free reign with the printer. The Epson UltraChrome XD pigmented ink yields archival prints guaranteed for quality. The prints are smudge and water resistant, but not intended for outdoor use. The cartridges are good for two years after the date of production. Epson offers a one-year warranty that includes onsite service within the next business day. Testing never required onsite service, but some customer cases were discussed with the technicians who picked up the machine after this review. There was an anecdote about one customer who was using a printer in an unheated storage unit that caused some issues as the ink viscosity thickened with colder weather. Other than that extreme-environment example, most other calls related were typical maintenance. The configurability, speed, ease of use and different price points of this large-format printer family make it a good fit for a wide range of offices and operations. The intuitive LCD screen menus, automation to configure the proper print for each paper, and the printer driver with configurability and job queues made the printer very easy to operate. Printing to a large format just as you would print to a standard office printer was a pleasant surprise to many. 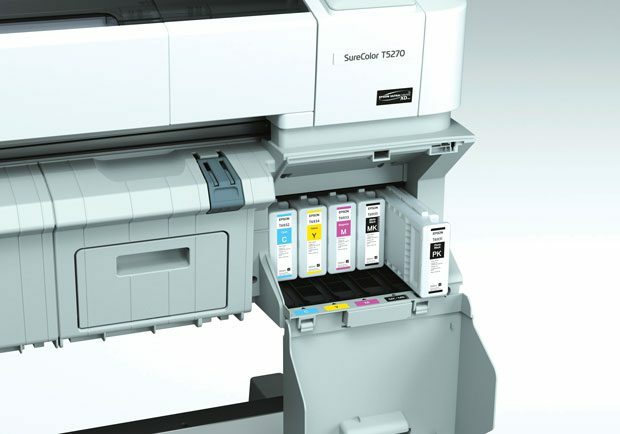 Shortly after the review period was over, Epson released an impressive firmware update for the entire line of SureColor T-Series printers to streamline workflows and deliver prints faster. Promised improvements include faster scanning as well as 24” x 33” prints produced 31 percent faster, and glossy prints up to 75 percent faster, in a new production print mode. The firmware update illustrates continued optimization of printer components, with customers’ needs and issues addressed without having to move to a next-generation printer. The Epson SureColor T-Series printer is meant to be a workhorse that presents projects and products in the best possible resolution, allowing users to add functionality as their practice demands.